Coron Island, an archipelagic town in the province of Palawan, is a mountainous island with 50 minor islets rich with immaculate beaches and amazing karst rock formations. No wonder why it is often listed in prestigious magazines and influencers as one of the best islands in the world. Indeed, a perfect island hopping experience awaits at Coron. 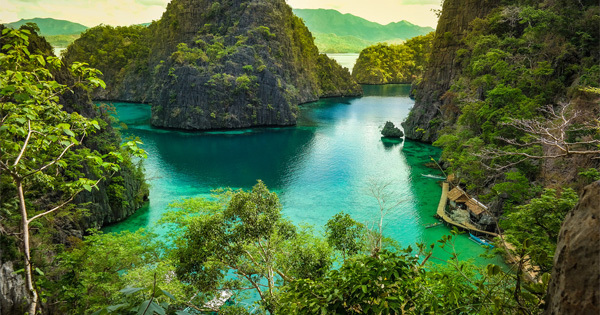 #1 - Kayangan Lake: Bright turquoise waters with rich underwater marine life surrounded by stunning, towering limestone formations and lush greeneries, this lake in Coron will surely put anyone in a state of captivating trance. Its water consists of 70% freshwater and 30% salt water dubbed as one of the cleanest lakes in Asia and is often called Blue Lagoon. The 10-15 minute steep hike of around 300 steps to the inland lake is totally worth it. #2 - Twin Lagoon: As implied by its name, this unique lagoon is separated to two by towering karst walls. The first, bigger lagoon is where the boats pass by or dock. The second is hidden and is only accessible through a small opening during low tide or through a ladder during high tide. Another amazing thing here is the temperature of the water which incredibly changes between hot and cold that is related to the merging of cold freshwater and hot salt water. #3 - Barracuda Lake: Often referred to as a weird and crazy lake, this lake has a visible division of salt and fresh water that experts call thermocline. There were barracuda skeletons found there in the past and until now, barracudas can be seen, hence the name. Don't worry, though, there were no reports of barracudas harming people yet. The hike going to the lake takes about 30 minutes and is a bit tricky so be extra careful. #4 - Siete Pecados: Just a few minutes from Coron town proper, this paradise consisting seven small islets could take one's breath away with its rich marine life and biodiversity. The ominous name siete pecados, which literally means seven sins in Spanish, originated from an old tale of seven sisters who went swimming against their mother's orders, drowned, and left seven small islets on their path. Although this legend may seem freaky, the beauty of siete pecados is more than fascinating. #5 - Coron Bay Wrecks: Listed as one of the World's Best Dive Sites by Forbes Magazine, divers from around the world flock to Coron Bay for an extraordinary underwater experience. World War II had been destructive in the past but it has left a beautiful sunken monument. The dive sites have massive shipwrecks, each with a peculiar, mysterious feel to it. Some of the must-see dive sites are Irako Maru, Okikawa Maru, Kyokuzan Maru, and Akutsishima. #6 - Maquinit Hot Springs: There's no better idea than heading on to Maquinit to sooth the aching body after a tiring tour. Its therapeutic waters come from a volcano, which explains why it is hot. It is also the only known natural salt water hot spring in the Philippines. Free your mind and just bask in the beauty of nature with the picturesque lines of mangrove, hills and the sea.